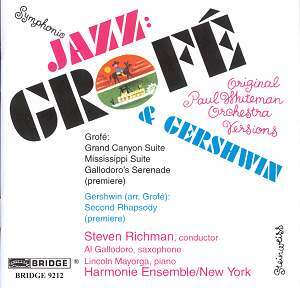 I enjoyed Naxos�s recording of Grof�s Mississippi and Grand Canyon Suites (see review). This was of the more widely encountered and fuller orchestral versions. Here, however, we have something of a novelty in the shape of the original Paul Whiteman band versions of both these suites, and the premiere recording of Grof�s Gallodoro's Serenade, as well as Grof�s arrangement of Gershwin�s Second Rhapsody. The band arrangements naturally add a more immediate sense of time and place as well as a more tactile drama. The rhythm is made more explicit in the Mississippi Suite and indeed its second movement, Huckleberry Finn, emerges as a really cocksure character study with tight brass, Roy Bargy style piano interludes, and finely evocative saxophone cushioning. It means that the work emerges in a less impressionist and in some ways less conventional light. Whereas in the lush orchestral version I heard echoes of Smetana in the first movement and Francophile affiliations elsewhere, here they are harder to locate. Here we have a robust twenties sound; banjo, saxophone and a brassy promise. The Grand Canyon Suite does however retain its sense of place and evocative summoning up of mood, languor and immensity. The few strings remain lissom when required, and the cor anglais adds plangency to the very precise sound world depicted by Grof�. Orchestration remains tightly organised and full of subtle colouration. The Francophile sweep of the second movement is shrouded in warm haze.� And the central movement, On the Trail, that riot of avuncular cowpokery is deftly done, complete with violin solo and celeste. The storm is accomplished with considerable brio and there�s a grand finale. The remarkable Al Gallodoro, now in his early nineties, turns up to give the premiere recording of a piece written for him in 1958, Gallodoro's Serenade. He seems to have lost little of his tonal allure and little of his digital dexterity, or lip come to that. His tone is still full and alluring, his cantabile is free and easy, and the quicker runs are taken with enviable lip and breath control. Youngster Lincoln Mayorga keeps him company. The Gershwin features the tangy pianism of Mayorga once again. Ensemble is good and there�s a winningly warm central section. Peppy and well articulated the playing embraces lyric curve as much as tighter corners, though it does remain an occasionally problematic piece structurally. The notes are up to Bridge�s usual high standard and the recording team have done well to produce so warm and yet defined a sound-stage at the Performing Arts Centre, Purchase College. Symphonic Jazz was always a much-abused term but in these surroundings it goes down like a good Sauvignon.